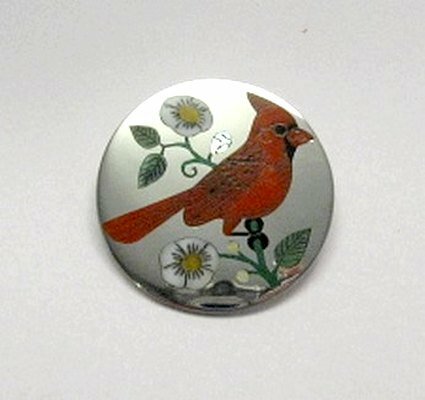 Spectacular inlaid cardinal bird pin / pendant, created by Ruddell & Nancy Laconsello, one of the best Zuni husband and wife teams working today. The artists are especially well-known for their inlaid birds. The pendant features a beautifully etched inlaid cardinal, inlaid with genuine coral and other semi-precious stones & shells. The detailed inlay is impeccable. 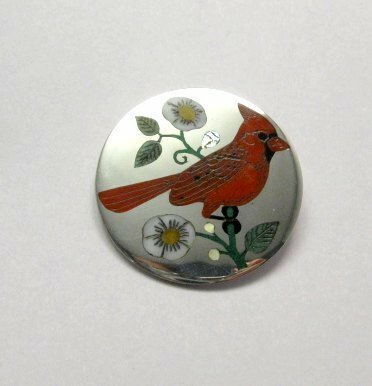 The diameter of the pendant measures 1-1/2 inches wide. It weighs 11 grams. The pendant was photographed at an angle to avoid getting reflections in the silver. (And still there are reflections near the bottom of the pendant). It was next to impossible for me to get a decent photograph of the pendant straight on. Brand new and in perfect condition. Gift box and Certificate of Authenticity included with your purchase. 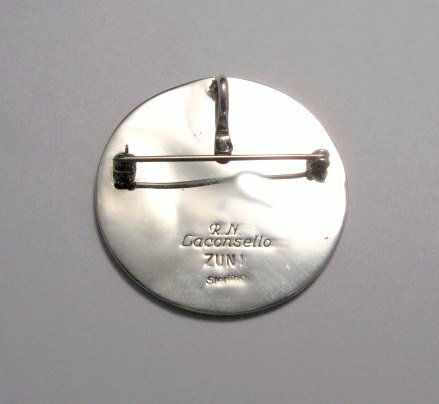 Be sure to add this top-quality Laconsello pendant to your Zuni Indian jewelry collection. About the artists: Nancy and Ruddell Laconsello have been making jewelry together since they were married in 1976. She does the inlay, and he does the silverwork and etching on their collaborative pieces. Nancy's sister is Dolly Banteah. You can read more about these famous Zuni artists in most of the authoritative Zuni jewelry reference books.